Hello! How was your Memorial Day Weekend? I had a wonderful and fun 3 days with my family:) Now I'm just trying to finish up the final few days of school with Avery and then I will happily welcome summer vacation! 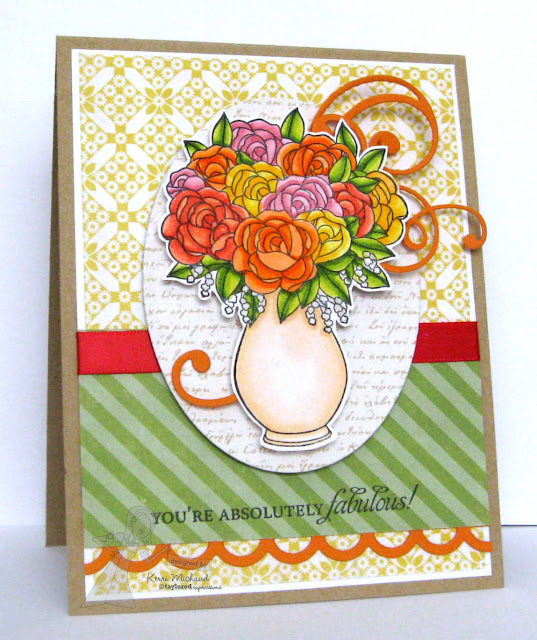 I wanted to share a card that I made using this beautiful image from Taylored Expressions called Rose Bouquet. I really wanted to color the roses using several different Copic colors, and I love how it looks! I also added some Curly Swirlies flourishes behind the image for some added interest, and I used the Open Scallop Border Die for the border. The dp is Echo Park Paper Co. For the Record 2 and I also used some ribbon from the January 2013 KI Ribbon Bundle which coordinates with this paper collection. Well, I am busy working on the new release for next week! Trust me, this release is so much fun and I am having a blast playing with the new goodies:) Thank you so much for stopping by today, and have a terrific Tuesday! AACCKKK! This is GORGEOUS!!! Love it!